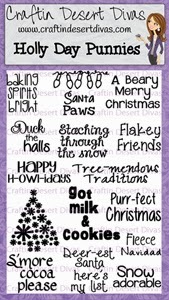 Lori here with a fun card I created using one of Tara's newest stamp sets "Holly Day Punnies". You can purchase this set, as well as other amazing sets, at the Craftin Desert Divas Shop. And, don't forget to share your projects using any of the CDD stamp sets at the Craftin Desert Divas Gallery. More details about my card can be found on my blog. Please visit us daily for some more crafty inspiration. Super cute card. I love the sentiment. I will have to purchase that set. Have a fabulous day. This is just ADORABLE! I love the sentiment. It made me giggle. Gorgeous card design too. LOVE the hexagons!!! Super cute card. Love the papers you used for the hexagons to make it look like Christmas, and that little owl with the santa hat is so cute with your sentiment. Love it. LOVE it!!! From the oh so cute owl to the octagon shapes and design paper your card is perfect for the punny sentiment. Thanks for sharing. I am OWL crazy this is so cute! This is so absolutely adorable!! That owl is so cute!! I love the design and papers!! What a fabulous card!! Love that card!!! Those stamps are adorable!